Turn any venue into something magical with our brilliant backdrops, created to bring a touch of flair and style to all events. 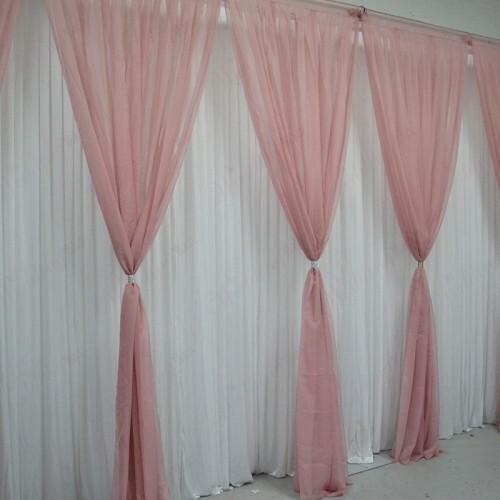 Wedding planners and event organizers will appreciate the high-quality of our pleated curtains and unique wedding backdrop designs, which we are able to offer at wholesalers’ prices. A lot of time and money has been spent on creating the perfect party backdrop design, using fabric that is thin enough to see the pretty lights twinkle through, but thick enough to hide any other paraphernalia that might be behind it. Our extensive research is what puts our party drapes above the competition. 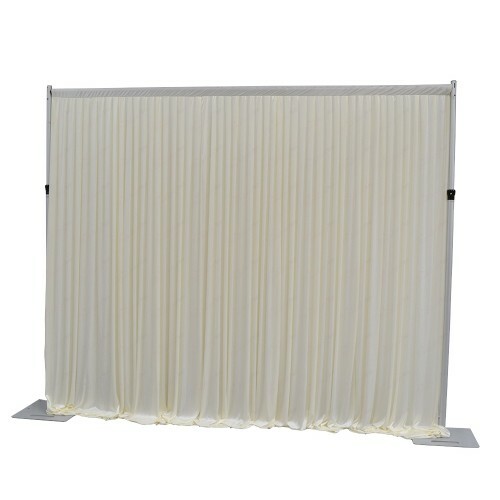 Intended to use as a backdrop for an important event, such as the exchange of vows, or behind a stage for an extravagant ceremony, this classy ready-to-hang wedding curtain makes the perfect setting for photographs. If you have ever wondered how to make a wedding backdrop, these dramatic drapes are a wonderful, budget-friendly way to decorate an entire room, giving it a clean, crisp effect. 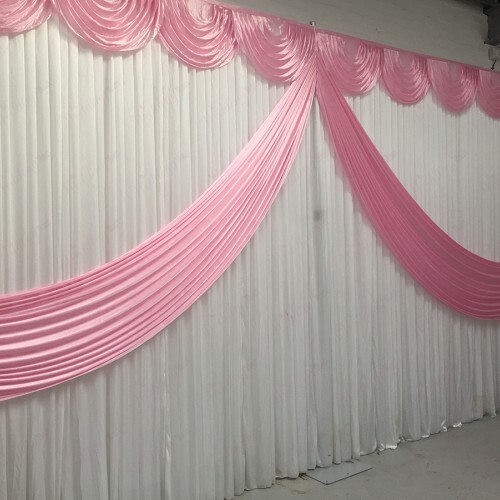 As a trusted wedding backdrop manufacturer, we are proud to showcase our innovative Pipe and Drape system that makes the erection of these fabrics incredibly easy. 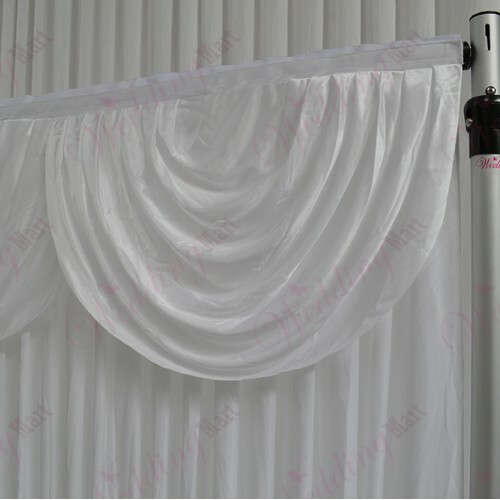 At the top of each ready-made wedding drape curtain, there is a wide reinforced pocket to slide the pipes through, with a gap in the middle for crossbar connection. There is also an extra wide Velcro strip at the top of the fabric which allows you to attach various adornments with ease, including drapes, swags and sequins. 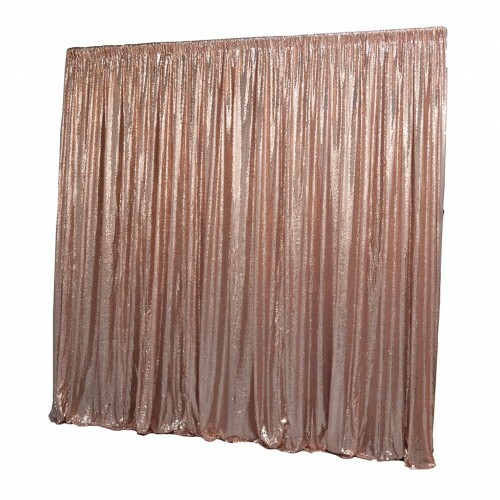 You might like to use our pre-lit LED backdrops or use your own lighting to give the popular star curtain effect. For something a little bit different, take a look at our Devidas backdrops, our Grecian overlays and butterfly backdrops. Creating the perfect look for an event can be challenging, particularly with last-minute changes and unforeseen circumstances. 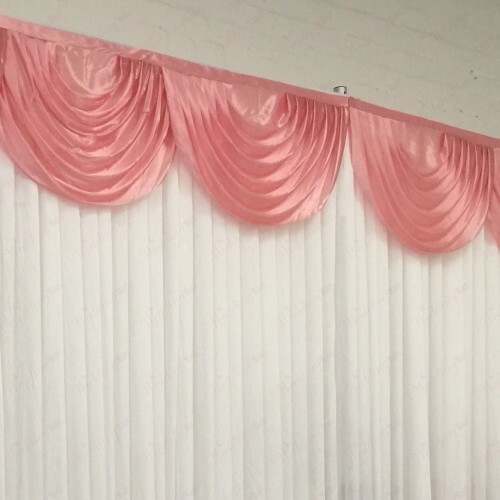 To make things a little easier, our venue draping can be purchased in bulk, with many of our wedding curtains available for next day delivery when purchased before 1pm Monday to Thursday. This, coupled with our wholesale prices and unbelievable quality, ensures that any event is sure to have the perfect scenery. WeddingMart’s collection of stunning Wedding Backdrops enables you to highlight any space in your venue to the delight of wedding couples and their guests. 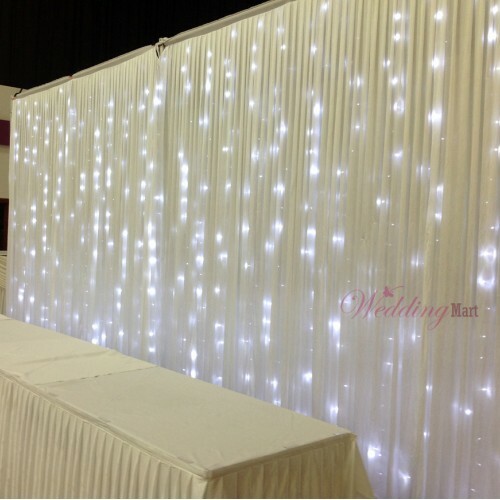 Utilising an innovative Pipe and Drape system manufactured exclusively for WeddingMart, our high quality wedding backdrops provide exceptional versatility in size and decoration, particularly when coupled with our sumptuous range of backdrop curtains, LED starlight lighting and removable swags. WeddingMart’s Wedding Backdrops are easy to assemble and available for next day delivery when ordered before 1pm Monday to Friday. 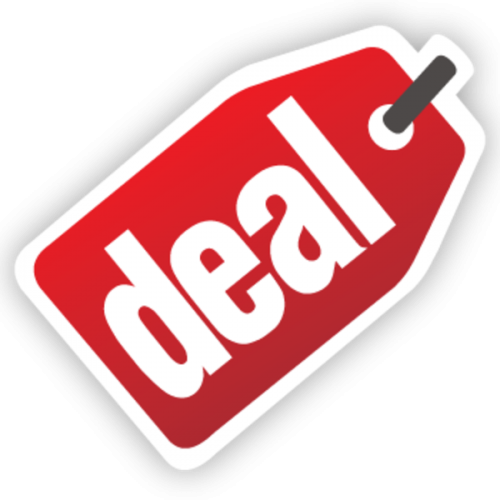 Plus, as the UK’s leading backdrop wholesaler, you’ll benefit from WeddingMart’s exceptionally low prices.